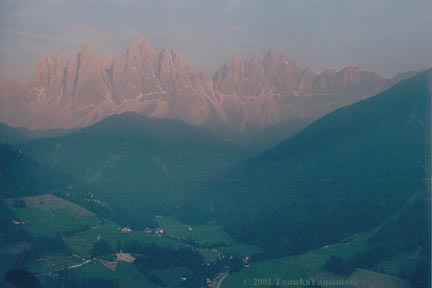 In the evening the Geislerspitzen in the Dolomites glows as the rocky peaks reflect reddish sunlight. This breathtaking glow is called 'Enrosadira', 'Alpenglow', 'Alpenglühen'. This photograph is the last of several photos I took from Tschanduihof in Coll with the 65-200mm zoom lens on my Olympus OM-4TBlack. The other photos are Geislerspitzen from Coll and St. Johann in Ranui. and these prints are estimated to last 60+ years. Copyright notice is not on the print.